In order to provide the best possible nanopositioning equipment, nPoint follows an intensive calibration procedure to ensure each product meets the demanding specifications required by nanopositioning applications. Assembly of components without calibration does not produce systems capable of nanometer level accuracy. Actual position is measured with a Renishaw RLE20 laser interferometer. Piezoelectric actuators have inherent non-linearity and hysteresis errors associated with them. In order to minimize these effects, nPoint uses a strict calibration and linearization process that greatly enhance the performance of piezo stages when used in closed-loop mode. Figure 1 below demonstrates the large linearity and hysteresis errors of a piezo stage in open-loop mode. The stage used is the NPXY100-100. 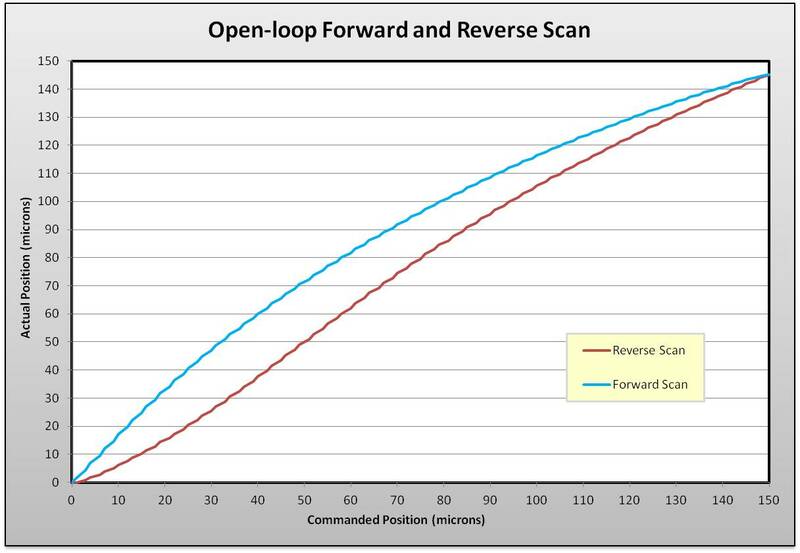 Forward and reverse scans were captured for 140µm travel in one axis of motion. 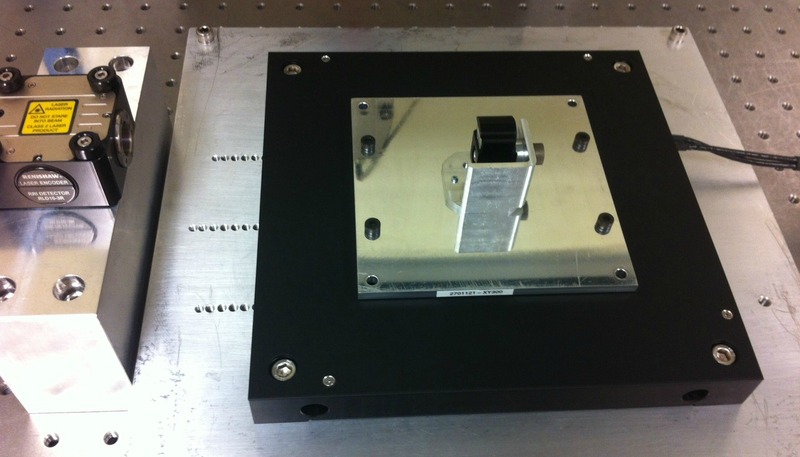 During the calibration process, interferometer data is used to characterize the uncorrected stage travel. The nPoint calibration software calculates a polynomial correction that is applied by the controller. 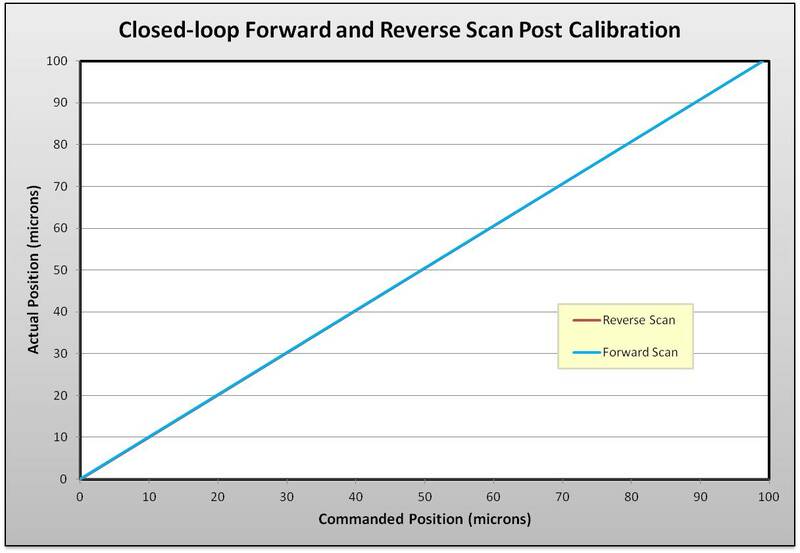 Figure 2 below demonstrates that linearity and hysteresis errors are virtually eliminated in closed-loop mode after calibration. 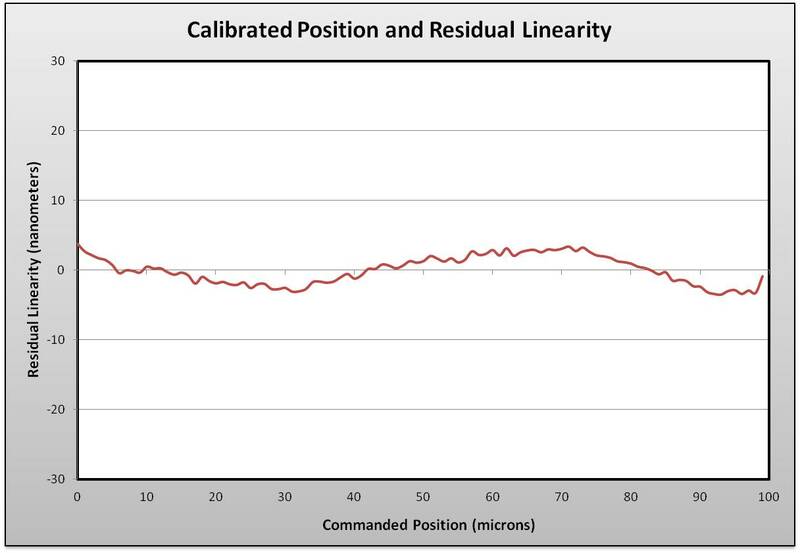 The nPoint calibration software checks for the largest linearity deviation of the actual position versus the commanded position. Figure 3 shows the linearity deviation of the data presented in Figure 2. The small high frequency noise in the data is baseline interferometer measurement noise. A specification of 0.03% linearity error for a 100 µm stage means that the data values in Figure 3 should be less than +/-30nm. The actual error is far below that, and the data shows a linearity error of 0.004%. While the specification is conservative in this instance, the product must also meet performance specifications under a variety of conditions in customer applications. 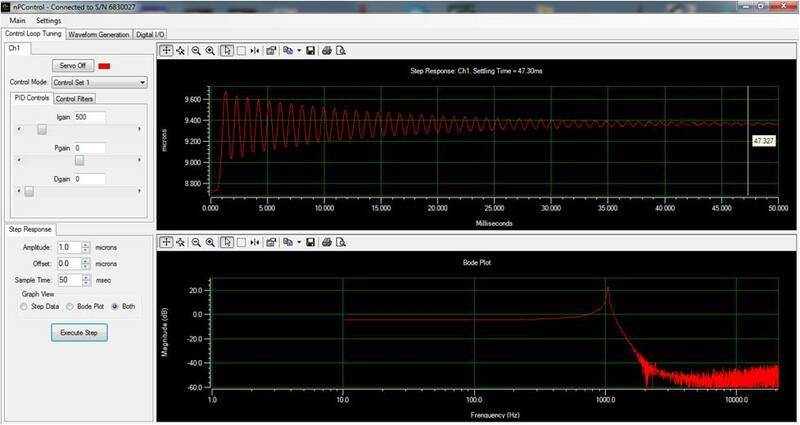 The stage resonant frequency can be characterized easily using the nPoint software, nPControl. nPoint resonant frequency specifications reflect measurements when the stage is not carrying a load. The data below was taken using an nPX100 stage and show a resonant frequency of 1KHz. The position noise is specified as RMS noise measured at the high voltage output to the piezo actuators while the system is in closed-loop. The noise magnitude depends on the closed-loop bandwidth. 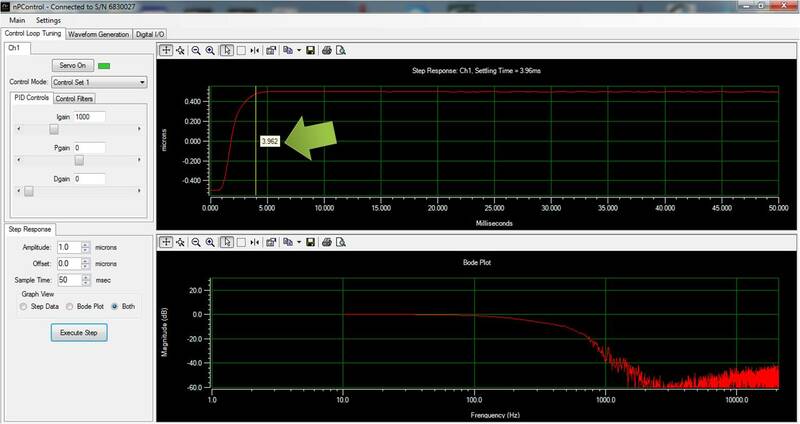 nPoint sets the closed-loop bandwidth to approximately 1/10th the resonant frequency for that measurement. Settling time can be characterized as the time for stage to move to a commanded position and settle to within 2% of its final value of the step size. A small signal step response reflects the dynamic characteristics of the system in more detail therefore, small signal settling time is normally used in the specifications of nPoint’s nanopositioning products. Settling time is taken for the response to 1 micrometer step signal and is also measured during calibration but at a higher bandwidth. The nPControl user interface enables easy calculation and adjustment of the system bandwidth, as seen in Figure 5 below. A video illustrating nPControl software and control optimization can be viewed here.